I've been busy on non-work related activities, for once! Owls: Saw-whet migration is upon us. 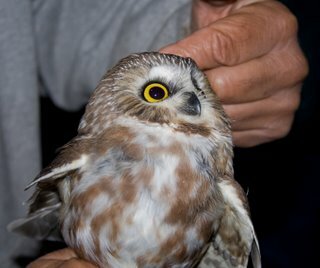 The local birders with Mass Audubon were caught off-guard by how many of the little owls are on the move south from Canada this year. Record numbers on some nights, and earlier than usual. These are tiny, adorable owls, who seem to like people and hang out for a bit. They even like being petted, which makes them a great ambassador for birdkind. Here's another set of photos (with a better macro lens) featuring yours truly holding one of these cutie pies. And just to be slightly scientific, the site with the most data on the migration patterns and how to track these guys lives at Project Owlnet. Last weekend I also went to a local UFO conference, hosted by Mass Mufon. There were two very interesting talks, one on crop circles and the other on the Shag Harbor Incident in Nova Scotia. The crop circle presentation started quite strong, with a lot of data and images that can also be found on the website at BLT Research. My data analysis interest was piqued but then dismayed by claims of correlations as "proof." The speaker got less scientific and more, well, peculiar towards the end when she announced a bunch of other phenomena including the ghost of her dead brother caught on film at recent circles. I don't quite understand why the folks interested in paranormal end up mixing it all together so readily; one phenomenon probably has nothing to do with another! The Shag Harbor UFO Crash Incident from 1967 was entertainingly recounted by Chris Styles, a good storyteller who had collected a lot of documents from the Canadian government (who are much happier to send things out on request than the US government). The most interesting sidebar was that a character named Maurice "Mace" Coffey was working as a parapsychologist investigating mysterious phenomena in the Canadian Air Force at the time of the "crash." He was the Fox Mulder of Canada. He's also editor of a collection of Maritime poetry and was later an important figure in the Northwest Territories (once helping find a downed plane, in which the survivor had lived only by cannibalism). I personally wanted to hear more about Mace, and maybe less about the RCMP. Ghosts: I've received a few more stories about Windhouse, the haunted house in Scotland that I keep track of here. The essay is updated at the bottom with more photos from contributor Phil Mortimer (scary Photoshop work as shown below) and from another relative of a former inhabitant, Kate Bainbridge. All Summer I had a female vulture follow me on my noon walks. I take a 3-5 mile walk around noon several days a week. One section - about 0.5 miles long - takes me through a somewhat open area with a few trees and a 2 lane road. Beth, a female turkey vulture, (Beth seems to work) started following me hopping from tree to tree. I think she was waiting for me to kill something for her. I would disappear into the woods at the end of that section, but Beth would wait for me to follow me along her section going back. I found myself looking forward to our walk together and was sad when she left in early September.